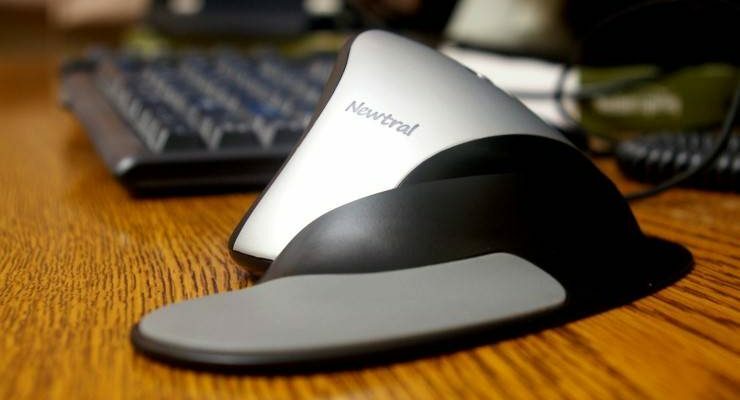 The Newtral2 ergonomic mouse is, in a sense, several mice in one. Though it has no moving parts for adjustment, this mouse comes with a number of magnetic interchangeable pieces that give it different shapes and features. It’s an innovative design, relatively affordable, and overall worth checking out. We can make it a couch…. 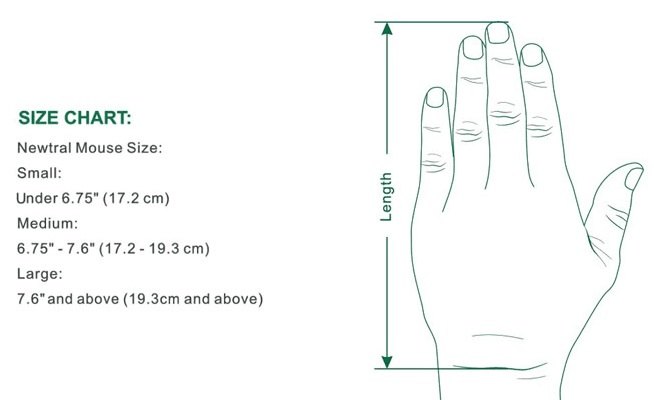 Attach the largest flange to the Newtral2, and you’ll get a mouse and support structure about the size of your palm (assuming you bought the right size; more on that below). The first thing you’ll notice is that the bony heel of your hand, instead of fighting with a hard desktop or clinging to the cold comfort of a thin mousepad, has a genuinely soft and comfortable place to live. As you might have guessed, this hand-heel paradise comes at a price. Because your hand is fully supported, you have to move the mouse with your whole arm. So, like any large mouse, the Newtral2 in this configuration is useful only if you don’t need to do extremely precise work. 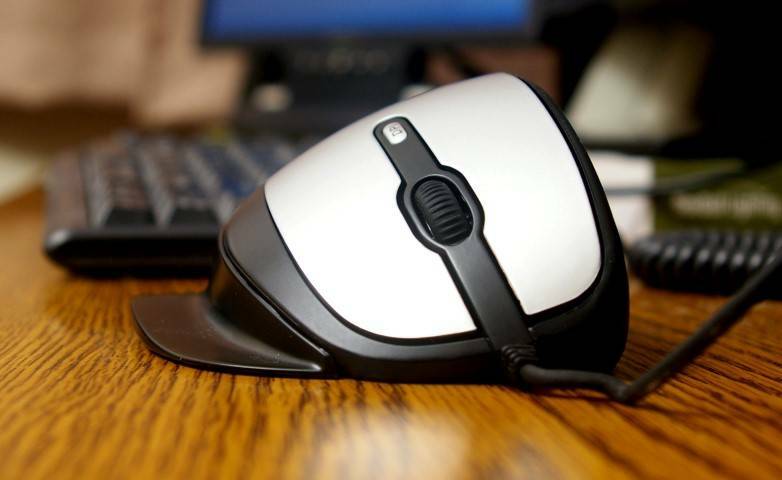 Unlike other large mice, however, the Newtral2 does not limit you to this one choice. With the medium-sized flange swapped in for the large one, the heel of your hand goes back on the desk, but your little finger – and with it, the side of your hand – stays supported above the fray. It is this in-between configuration that most users will probably end up sticking with, as it strikes a fairly good balance between comfort and precision. It also helps to keep your pinky from getting run over by the mouse, which can happen with the last option we’re about to look at. 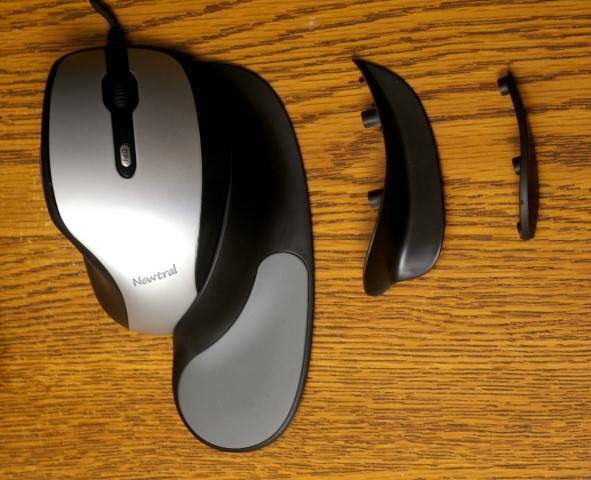 The Newtral2 mouse, shown here with its mid-sized hand rest flange, features an angle of 33 degrees from horizontal to avoid uncomfortably flattening your wrist. The Newtral2 with its large, medium, and small magnetic attachments. The Newtral2 has a dedicated button on top to change the resolution of the mouse – that is, to make the pointer go faster or slower in proportion to physical moment. This button is not a decoration (neither is its accompanying indicator light, even though the said light is disguised as a Newtral logo). For the right degree of precision, you’ll likely need to adjust the DPI setting every time you swap flange pieces – faster for the smaller shapes, slower for the larger ones intended to relax your whole arm. I haven’t used a conventional mouse as my primary pointing device in about three years. (Issues with my right hand have kept me very loyal to my RollerMouse Red.) I haven’t forgotten, though, how some mice just “feel” great to hold and use, and some don’t. I’m happy to say that the Newtral2 is one of the ones that does. The mouse is not coated, with the exception of the hand heel rest on the largest flange, but its material is slightly textured on the sides at least, and pleasant to the touch. For maximum comfort with a mouse like the Newtral2, it’s especially important to get the size that best fits your hand. Mine is right on the line between Medium and Large below. On the distributor’s recommendation I went with Large, and felt happy with that choice once I tried the mouse. 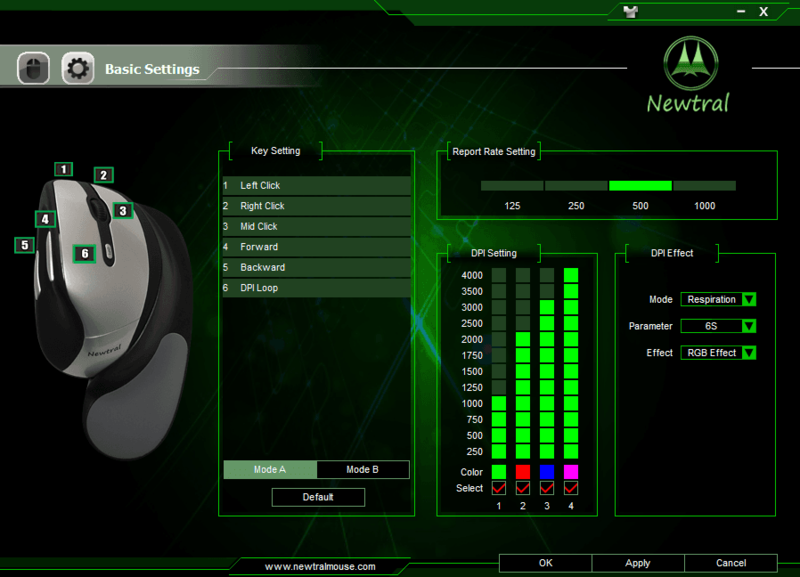 For those on Windows, there’s a fully-featured driver option available for the Newtral2 mouse. (Don’t worry Mac users – the Newtral’s basic functionality works without a driver.) I was actually quite surprised by the things you can do with the single screen of options in the Newtral2 driver. In a pane on the left you can reassign all the buttons, and set your button assignments to two preset banks called “Mode A” and “Mode B.” (I haven’t yet figured out how to toggle between the modes.) You can also change the preset “notches” on the four levels of DPI adjustment, change the color code displayed on the mouse for each, and even turn off any extra resolution settings you don’t need. How many pieces missing from this puzzle? One slight concern with the Newtral2: Three loose pieces means three pieces to lose, so you’ll need to exercise extra care to keep track of your mouse and its entire entourage. Thankfully, the Newtral2 comes with a nice cloth bag that’s just right for keeping everything together. The Newtral2 mouse seems to be making significant headway in the ergonomic market, and there’s good reason for that. Individuals and corporate wellness departments alike will appreciate its price, ease of use, and adaptability per user – adaptability on an ongoing basis thanks to the easily-interchangeable pieces that come with the mouse. This mouse is not a rebranded hash-up of previous concepts, but a worthy competitor for existing designs that builds and improves on conventional ideas – which, after all, is what innovation is all about. Disclosure: This review was made with a complimentary sample from Key Ovation, the US distributor for the Newtral2.